Hull form would dictate degree of pitch and roll, stabilizers would dampen pitch and role to degree but anything above 5 dgrees pitch or four degrees roll either side of centre washed out flying stations. While the roll rate on the CPV is quite stable, the pitch is probably in excess of 10 degrees. Footage from recent Naval ex. Unfortunately the Irish Naval Service are unable to provide a vessel for tours during this years Open Weekend due to operational reasons. A ship was due to be at the City Quays on both Saturday and Sunday, and over the last number of years has proved to be hugely popular with the public. The Cork Harbour Open Day committee and the Irish Naval Service regret this unavoidable development, and apologise for any disappointment caused. However, there will still be plenty of activity in Cork City. On the Saturday Scouting Ireland host a fun raft race at the City Quays at 1PM and there is an inter-firm Dragon Boat Race at Cork Boat Club between 3PM and 7PM. Also on Saturday there is an open day at Cork Boat Club from 11AM where visitors can view the facilities while enjoying a coffee and home baking in the café. On both Saturday and Sunday Atlantic Sea Kayaking will be there to take you under the bridges of the river Lee at a special Open Weekend price of €40 per person. The launch from Lapps Quay opposite the Boardwalk Bar and Grill. See their website, linked below, for more details. With the vast structural improvements , countrywide, proposed for an expenditure goal of 115 billion Euro, it seems to me that the package should include upgrading Sligo to City Status and bring the port up to modern standards with 6.5 m LWS in channel and alongside in new berthage for ships up to 135m overall. It would be a tide independent haven and could become a naval port on the west coast. There is a Bay on the North side of the entrance that has interesting dimensions and possibilities. A bit of infill, extend a headland area, stick a light on it, put in American style berthage, and get OPW to maintain it, connect to R291 and hey Presto, Naval Port Westhaven, Sligo. Marine Ports and airports will always attract traffic and business. Infrastructure is not just roads but what you put along it's route or at it's terminal points. As a state we have marked time or closed down decent items the Brits left us. We strangled key industries on short term exigencies. We do need another Naval Port. Our Marine planning is run by the same Department as Sewage , housing, environment, social housing provision, and all planning matters associated with land and Sea. Organise the commercial side of Sligo port to have a freight rail link. If you're wanting to get infrastructure on the west coast, then get involved in the Galway port redevelopment, loads of berthage proposed..... pay for access or rent berthage there. Also Renmore is right next door to the proposed redevelopment, so it would naturally act as the secure location for any equipment...... and Galway is a much better run ashore! 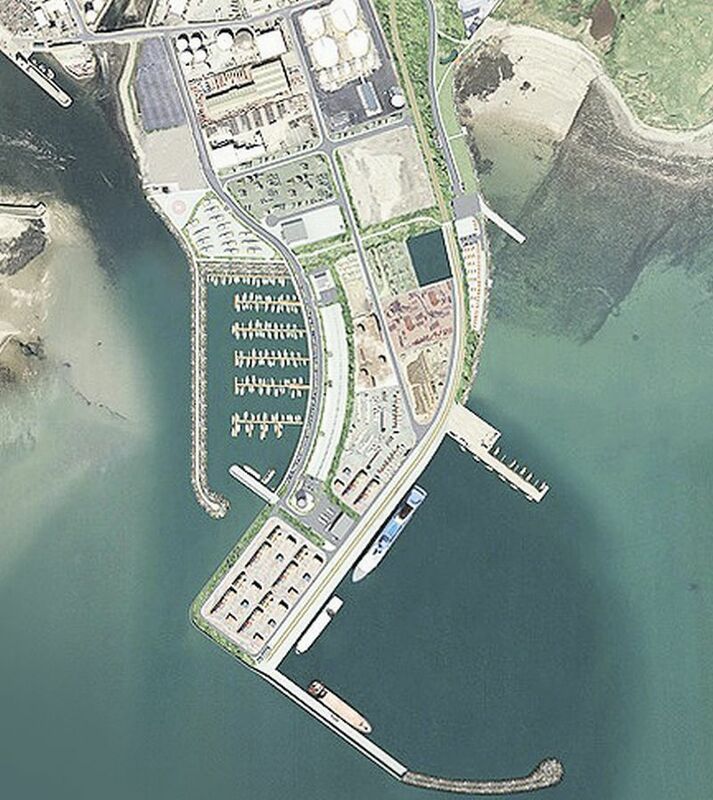 If we are going to build a New Port with a dedicated Naval Berth then all options should be considered. In Marine Notice No.1, from our DOM, where waters in port areas are being assessed, Sligo gets smooth waters inside the Metal man beacon and calm waters approaching the harbour. Blacksod has a lesser rating due to the fetch to the east off mountains and the north south orientation of the bay itself. I will say I held position there in force 11 while at anchor. Galway is a lock in Port at this time. Silting in harbours is a matter for dredging and maintenance of depths. If you co-habitate with commercial interests, then DOD (NS) won't carry the burden of dredging by themselves... port of cork being an example. Yes Galway is a lock a t present, but that's why I put up the pic of the proposed development..... the proposed development is accessible at all times (and very close to another DF establishment). Sligo is probably one of the smallest commercial ports in the ROI (maybe Youghal behind it). Blacksod is a very large natural bay, yes exposed, but as you indicated yourself, an extremely safe anchorage in heavy weather, especially in winter. The Galway Harbour project is verbally rejected by the worst Minister in the current Dail. I would support development of Galway Port but the plan needs to be more ambitious with possibly a dedicated all tides Naval Berth of at least 135 meters for MRV. We are due to spend 115Billion Euro on infrastructure with little or no mention of Port and Marine development-harbours, cargo handling, berthage, drydocks etc. In the list of European cargo Ports the only port mentioned North of Galway, is Sligo and after that Belfast and UK ports in order of accessibility. The unfortunate fact is our Dail reverts to type and the elected types want to decide where money will be spent. It is all Pork Barrel economics with no rhyme or reason. They don't have the skills other than to goad the public and each other, while some get immensely rich. Twenty percent in the Dail are Landlords-more vested interests-at least the US makes such heroes shed there assets. Such investments are pandering to already Public/Private groups with deep pockets and established customers and routes. In the last great leap Forward and National Spatial Strategy, Sligo harbour ( now under Sligo County Council ) submitted a study and proposal to skim dredge to 3 meters below Chart datum by removing some 250,000 tonnes of dredge materials but only to about 3 quay areas. The plan was to create at HWS a 1 hour opportunity for a ship with 5.9m draft to berth at a designated pier. At low water she would be sitting in the mud. The piers are currently 77m and 55m in length with ships up to 100m in length and 5m draft accepted with overhang and low water gardening opportunities. We noted in all their case making that the NS doesn't appear as a factor for harbour expansion. We are still Not developing, just reacting to passing trade like Moneypoint solid fuel Power Station. Sligo is a Government port and could be developed by bringing in Dutch Hydrostatics Engineers. Its already started - Kehoe was on the radio over the weekend in a debate about developing Rosslare - isnt that his backyard? The port is dead, barely a restaurant left open. The town survives in spite of this, but is mostly bypassed by those going to or from the ferryport. The rail service to Wexford (never mind Rosslare EUROPORT) is shocking (especially when you think that the commuter belt extends to at least Gorey). Try explaining to someone just arrived in rosslare that not only can they not use the station in the terminal but also if they plan on going to the next city in the south east (Waterford) they'll have to get a train to Dublin first. Waterford still has surplus lolo space at Bellevue. Last time I was there I was sure they ripped up the the track to the terminal. I remember when foot passengers where able to walk onto the ferries now they all have to get a bus. The upstairs restaurant would be packed and the shop downstairs would always have somthing for the tourists. The place is empty now with a little coffee kiosk. Alot of this was of course before Duty Free was abolished and the ferries lost alot of foot passengers to the low cost airlines. I remember a couple of tourist once asking when the next direct bus to a certain location in the south east was, the answer was Sunday, and this was in the middle of the week! the rail line is still there between rosslare and waterford isnt it? is part of it a greenway now too though? The greenway is the old Dungarvan to Waterford line. I'n not sure about the condition of the Waterford to Wexford line. L.E. William Butler Yeats currently visiting Kiel, Germany. The Irish NS has a long tradition of being in attendence for Kiel week (Kieler Woche), now in its 136th year. It is joined in the historic naval port by Foreign Naval visitors from Denmark, the UK, France, Norway, Netherlands Spain and Lithuania. Did you not mean; Eithne is visiting Lough Swilly Naval Base?